Moist to dry. Upland deciduous and coniferous forests. Full or partial sun. This is a fast-growing, deciduous shrub rising on numerous stems from large, horizontal rhizomes usually 4 ″ to 6″ below the surface of the soil. It often forms a dense, rounded clump. It sometimes forms thickets. The stems are slender, straight, and sparsely branched. They are usually 5′ to 10′ tall, but mature stems can reach up to 13′ in height and ¾″ in diameter at breast height. Outer stems become arching and spreading with age. The bark on young stems is light grayish-brown, shiny, and smooth. On mature stems the bark is somewhat rough, sometimes with finely grooves or ridges. It is not shaggy or peeling. The branches are ascending. First-year twigs are slender and tan to dark brown. They are hairless or sparsely covered with long, spreading hairs that are red when young, whitish later. They do not have glandular hairs and are not sticky or resinous. Second-year twigs are zigzag and hairless. The buds are broadly egg-shaped, about to ⅛″ long and wide, brownish-gray, and unstalked. They are covered with 4 to 6 scales. The outer bud scales are deciduous, falling away early in the season. Winter buds are angled, not rounded, at the tip. 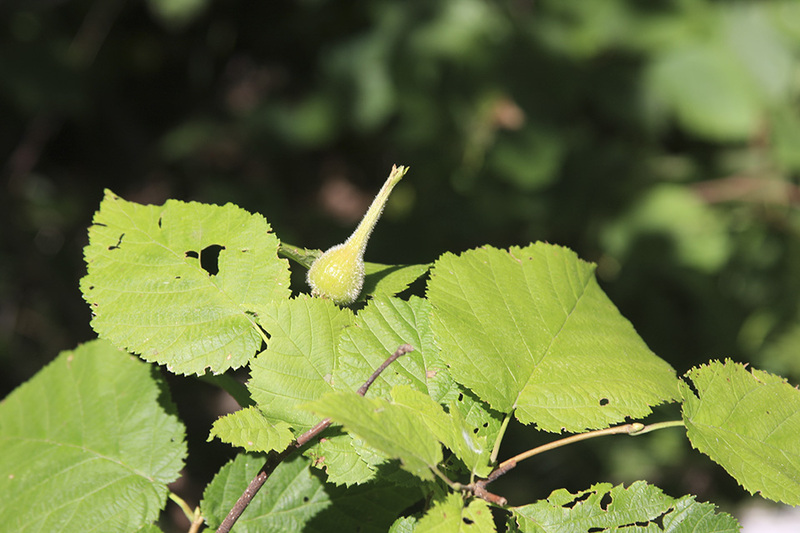 Flower buds and leaf buds are similar in size and appearance. 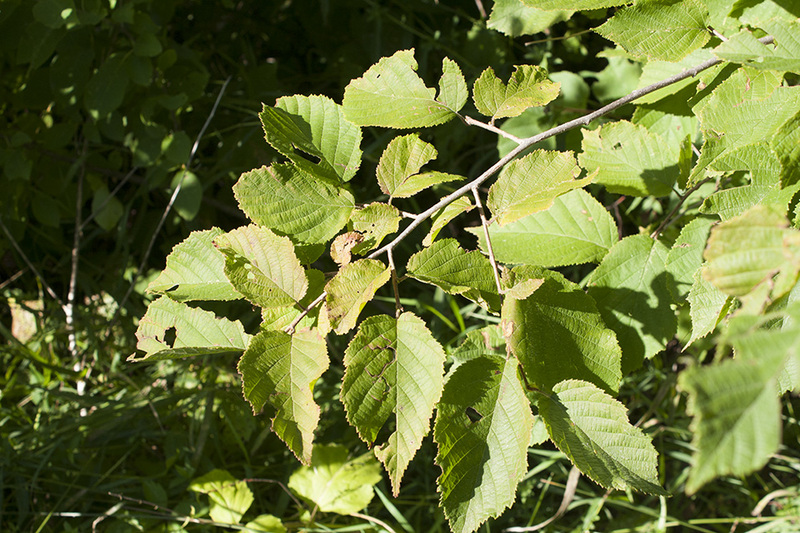 Leaf scars are small and flat or slightly raised, not depressed. They have 3 bundle scars. The leaves are alternate, broadly egg-shaped to broadly elliptic or broadly inversely egg-shaped, 2⅜″ to 4⅓″ long, and 1⅜″ to 3″ wide. They are attached to the twigs by ¼″ to 11 ⁄16″ long leaf stalks. The leaf stalk is hairless to moderately covered with long, spreading hairs that are red when young, whitish later. It does not have glandular hairs and is not sticky or resinous. The leaf blade tapers to a sharp point at the tip and is heart-shaped or rounded at the base. It often has straight sides, giving it a squarish appearance, and is occasionally slightly lobed near the tip. There are 6 to 9 lateral veins on each side of the midrib. The lateral veins are sometimes branched. The upper blade surface is dark green and sparsely hairy. The lower surface is pale green, felty to the touch, and covered with soft, spreading hairs, especially along the larger veins. The margin is irregularly doubly toothed with sharp, forward-pointing teeth. In the fall the leaves turn yellow to orange. Male and female flowers are borne on the same branch. Male flowers appear in late summer usually in clusters of 2 or 3. 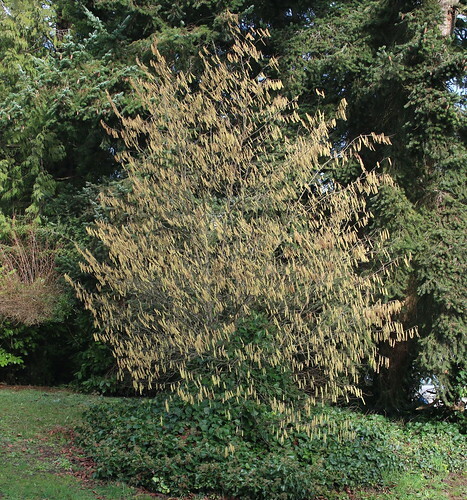 They are green, slender, cylindrical, unstalked, drooping clusters of many flowers (catkins). 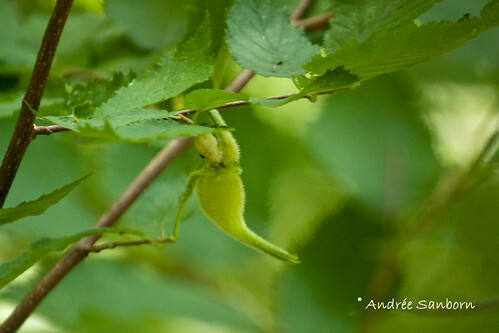 They droop or curve downward from the leaf axils of twigs of the previous year. They turn brown in the winter. In the early spring they become yellowish and elongate, becoming 1″ to 1⅜″ long. They shed their pollen in early April to mid-May. 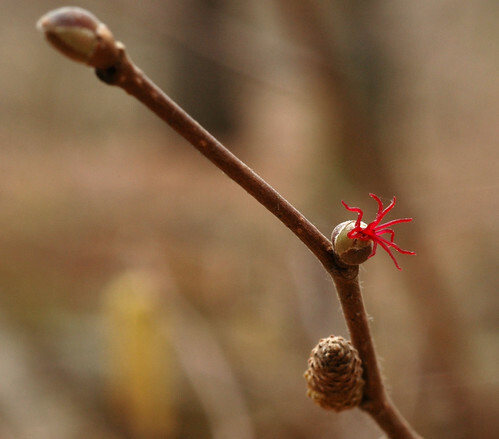 Female flowers are much smaller, compact, reddish-brown catkins that resemble leaf buds. They are concealed by overlapping scales with only the elongated, bright red stigma and styles exposed. They are subtended by a minute bract and a pair of bractlets. The bractlets get much larger with age, becoming the husk of the fruit. The fruits appear singly or in clusters of usually 2 or 3, sometimes 4 or 5. 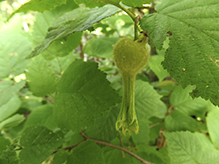 Each fruit is an edible nut enclosed in a leaf-like, long, tubular husk. The husk is 1⅜″ to 2⅜″ long and 3 ⁄16″ to ⅝″ wide beyond the nut. It is 2 to 5 times as long as the fruit. The fruit is completely concealed. The husk is densely covered with stiff, bristly, nonglandular hairs. It does not have glandular hairs. The nut is more or less globe-shaped and ⅜″ to ⅝″ in diameter. It is enclosed in a hard shell. The fruit matures in late August to late September. 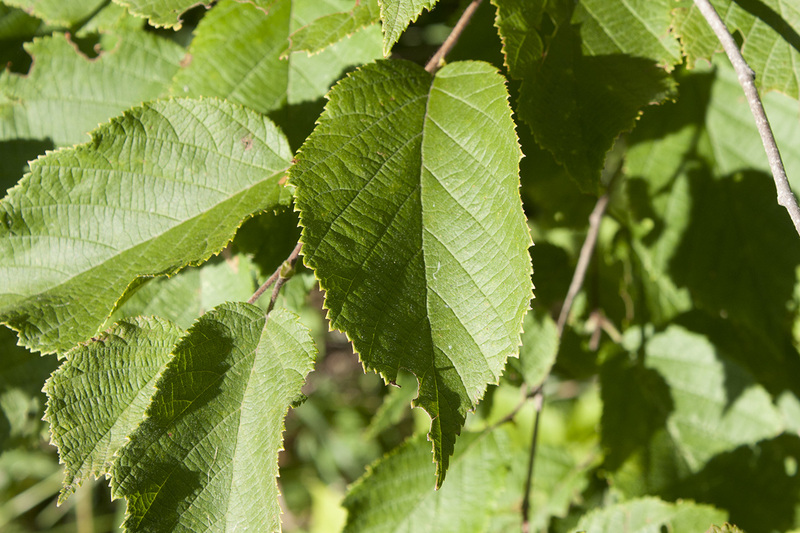 American hazel (Corylus americana) leaf stalks and first year twigs have stalked glands that are visible without magnification. 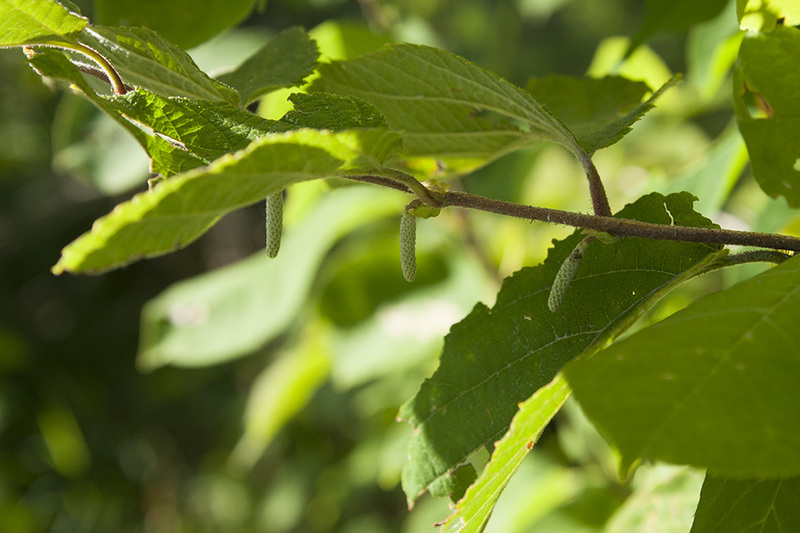 Mature male catkins are longer, the longer ones at least 1½″ long. 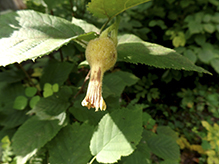 The husk surrounding the nut forms a short, broad fringe, not a long, narrow tube. The nut is sometimes visible at the end of the husk. This is for Iz Turley's phase 2 hardwoodsman challenge. The challenge is to give 2 uses for 2 trees and 2 plants and show them being used. 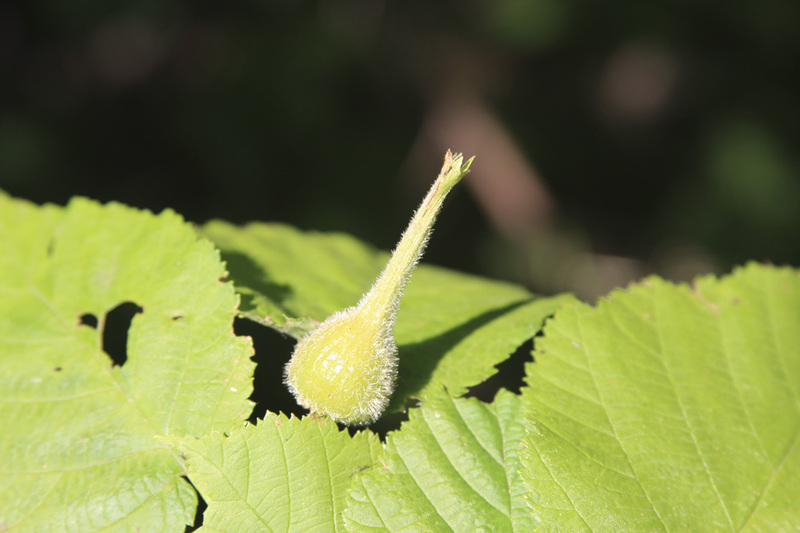 This will focus on the Beaked Hazelnut tree in western washington that is harvested in early august.